A few weeks ago, I had the very awesome opportunity to go visit the Blizzard campus for tons of fun and some great discussion with the WoW CMs and Devs. 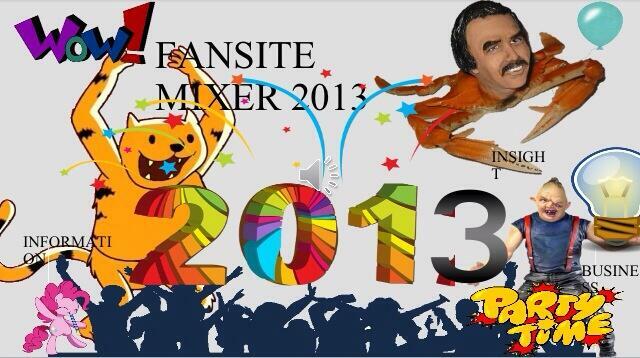 Community Manager Zarhym planned the intimate fansite mixer (and did an amazing job). Representatives from Curse, Wowhead, WoW Insider, podcast Convert to Raid, and Gamebreaker attended (nine of us total) for a chance to discuss the game and, more importantly, how Blizzard and fansites can work together to better serve the community. I was there to represent Curse as an MMO-Champion and wowdb.com global moderator. My favourite part of the day, and also the reason we were there, was the roundtable on Blizzard and fansites working together. We were given insight into the internal process Blizzard has for official, blogs, patch notes, forum communication, and other community manager functions. We talked about our own role as fansites, and discussed the opportunities and methods all of us can use in order to aid each other to the benefit of the community. Unfortunately, I am unable to share any of the details at Blizzard’s request, so just trust me it was really interesting and particularly useful to me as someone involved with MMO-Champion and wowdb.com. Oh yeah, and we also got surveyed in advance about the new transmog helms, purchasable-in-Korea XP buff, and other developments for the Blizzard store (now announced, which is why I can mention it). We also got a very cool preview of the products that will be shown at ComicCon next month, including a bunch of snazzy exclusives only available to attendees. If you’re into toys or collectables, you’ll probably want to check those out when they are shown this weekend! We also enjoyed trivia for prizes (I won a TGC loot card), generous giftbags, and an all-around good time. Oh, and we got to watch animated Zarhym serenade animated Ghostcrawler on the big screen. We had an hour to talk to three WoW developers and ask questions related to the content coming in 5.4. They had a lot of cool new information to share with us, most of which was not yet on the PTR at the time about the Timeless Isle, Legendary Cloaks, the awesomesounding new world boss, flex raiding, arena changes, Proving Grounds and more. For a detailed breakdown, check out chaud’s recap on MMO-Champion. A lot of this is on the PTR now, but not all of it, and the overview is still interesting to read. We were given an opportunity to try out their new online card game, Hearthstone, which was announced at PAX earlier this year. I was very enticed with the game and enjoyed it far more than I expected to. The games are fun and relatively quick. The rules are simple and very easy to pickup, but still has the potential for complexity and skill both in deck building and creating card synergies in play. I was impressed that they designed a game that could be easily played on a phone or tablet but still was completely enjoyable on a PC without feeling like you’re playing a phone app on a desktop. One of the cool aspects of the day was a tour of the Blizzard grounds. We got to visit the museum — currently mostly Starcraft II themed — and see a lot of models, concept art, videos, and other awesome relics. But the cool stuff doesn’t end there — all over the campus are awesome statues, art pieces, and other displays. 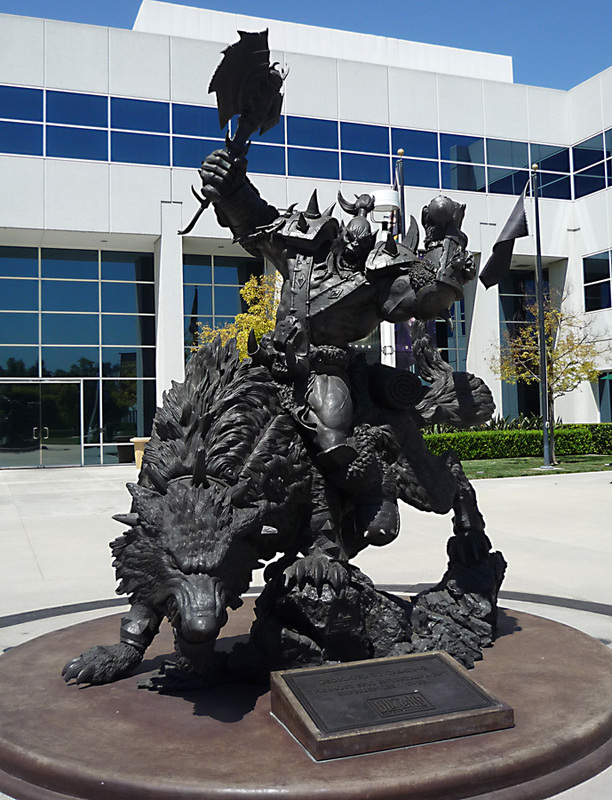 There is the famous huge metal orc statue in the front of the main entrance, and the statues of Illidan, Kerrigan and other game characters that you see at Blizzcon were tucked in the various lobbies and common areas. They have fan art on the walls, from the great stuff you see on the official website submitted by players, to the WoW themed comics done by Penny Arcade. A lot of their various products from over the years (tee shirts, models, toys, posters, etc) were on display throughout the buildings. 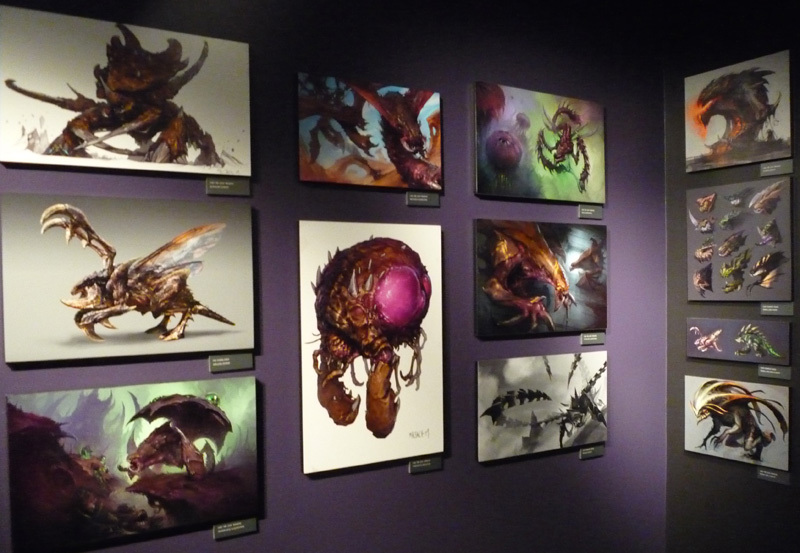 It was also very cool to see things like the signature walls from Blizzcon hanging up and other. We also got to see how some of the departments were decorated, as each gets to design their area in a very cool theme (the department we saw was zombie apocalypse!). Their break rooms are also amazing; one we stepped inside looked like we had been teleported back in time to an old speakeasy. My favourite part of the tour was getting to see Blizzard’s “mission control” room where they monitor their servers all over the world for problems. No photographs allowed (many threatening signs reminding us as much), but let me tell you – it looked as awesome as it sounds! Afterwards, we had a delicious lunch of carne asada street tacos, grilled portobellos and peppers, rice, margaritas, and other fixin’s. Bashiok’s skills as a grillmaster did not disappoint. Thank you very much to the Community Managers who made our day wonderful – Bashiok, Bornakk, Crithto, Daxxarri (raccoon-wrangler extraordinaire! ), Lore, Nethaera, and Rygarius, and a special thanks to Zarhym for putting the whole thing together for us. And thank you to the devs who also gave us their time to answer questions and give us insight and sneak peaks into the game!